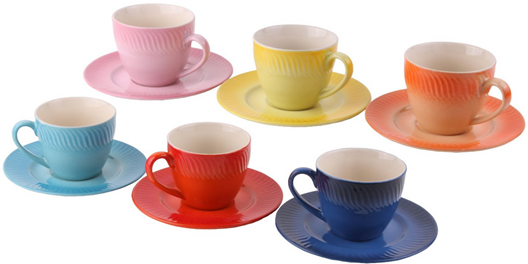 6 Colorful Ceramic 6oz Tea Or Espresso Cups With Saucers Just $6.95 PLUS FREE Shipping! You are here: Home / Great Deals / Amazon Deals / 6 Colorful Ceramic 6oz Tea Or Espresso Cups With Saucers Just $6.95 PLUS FREE Shipping! How cute are these? You can get 6 Colorful Ceramic 60z Tea or Espresso Cups with Saucers for just $6.95 PLUS FREE shipping! I love cups – mugs actually are my favorite I think. I love collecting them and I have many different colors and patterns, shapes and sizes. A friend and I were in Tuesday Morning one day killing time before a movie and we were laughing because I was stopping and telling her to look at all the mugs I found and she was telling me to look at all the bowls she found! To each his own, I guess!